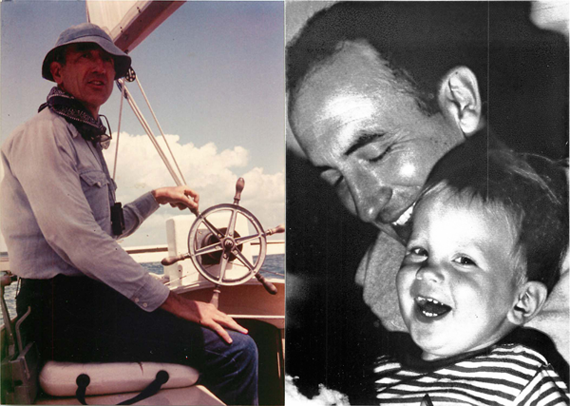 George Bunn (above, sailing and with son Matt) is one of the founding fathers of nuclear arms control. He was present at the creation of the Arms Control and Disarmament Agency, and served for eight years as ACDA’s first General Counsel. George participated in the negotiation of the Limited Test Ban and Nonproliferation treaties. Fortunately, he took notes during his years of public service, which is evident in Arms Control by Committee, Managing Negotiations with the Russians (1992). George wrote this book to add to the negotiating history of key accords and to suggest lessons learned, using the case study method. In his chapter on the test ban, George reveals that ACDA Director William Foster exceeded his negotiating instructions trying to bridge differences on the number of on-site inspections required for a comprehensive treaty. The Politburo finally budged from zero to three OSIs per year; the Kennedy administration wanted seven inspections, but was prepared to fall back to six. Before throwing in the towel, George relates that Foster held up five fingers to his Soviet counterpart, who scowled. A CTBT wasn’t in the cards in 1962-3 for this and other reasons. There is still along way to go before the CTBT enters into force, but as George wrote in The Status of Norms Against Nuclear Testing (The Nonproliferation Review, 1999), “there are norms operating against nuclear testing even though the CTBT has not been ratified.” Norm building is a poorly analyzed, alchemical process in which political activism, risk-taking leadership, resolute negotiators, and “mere words” combine to eventually gain the status of customary and then international law. All of the key bulwarks of arms control — the tradition of non-battlefield use of nuclear weapons, the global nonproliferation regime, and constraints on nuclear testing – began as outlandish notions that have become norms. Norms can be broken, of course. So, too, can traffic laws. But we would be much less safe without them. Without rules, there are no rule breakers. Norms, George wrote, “are international prescriptions for state conduct. They are principles, standards or rules.” Or as Abe and Antonia Chayes put it, “They are prescriptions for action in situations of choice, carrying a sense of obligation, a sense that ought to be followed.” The states of greatest proliferation concern are outliers, rejecting a widely shared sense of obligation. Norms clarify their outlier status, as well as the steps required for their rehabilitation. Norm building was George Bunn’s life work. His handiwork now constrains political choices, and helps promote personal, national, and international security. The “force” as in Luke Skywalker or are you taking something more mortal? Michael, your writing is very educative. We now still need more creative people like George Bunn to insist working on CTBT EIF. George’s accomplishments in arms control and international law are legion and it is a pleasure to read about them here. But he also has a very important impact on younger generations with his interest, openness, and generosity toward people just starting out in their careers. He is one of the reasons I enjoyed and profited by my stay at CISAC so much. Thanks for the post! “Norms can be broken, of course. So, too, can traffic laws. But we would be much less safe without them” … this is probably the best defence of customary norms I’ve read in a long while. Thanks Michael. Great post. Don’t meant to toot my own horn, but I just published an analysis of the nuclear nonproliferation norm, drawing on social psychology to explain the specific ways that norms go from the social environment into policymakers’ heads. You might want to check it out! Nonproliferation Norms: Why States Choose Nuclear Restraint Love the traffic law quote as well. I think in todays world the real threat to the humanity is arms race. Every country is trying to increase her capability of attacking others. On the same time they are ignorant of the disasterous end.